If you’re lucky enough to have a tree in your backyard that you play with your kids under or sit and read a book in the spring while watching the leaves bud you’ll want to take great care of it.This tree is a part of the foundation of your home and the aspirations you have for the memories you’ll make there. Taking care of this tree should then be second nature. With winter now in full swing, it can be easy to forget about the outside elements of your home that are in a sense out of sight and out of mind. Your tree is still out there. Be sure to take care of it even if it’s not offering a whole lot to your day to day at this moment in time. It’s not common knowledge that it’s much easier to prune in the winter. With all of the leaves gone, your arborist or tree trimmer can see the structure of your tree much more clearly. Proper, and regular pruning will prevent the loss of limbs or other failures that can occur during winter storms. Because your summer annuals have been removed by this time, it will be much easier to access your tree without disturbing your landscape. In some areas, your soil will freeze and allow our tree trimming equipment to gain better access which will reduce your costs. In our opinion, the main reason to prune in the winter isn’t for convenience, but improving tree health. 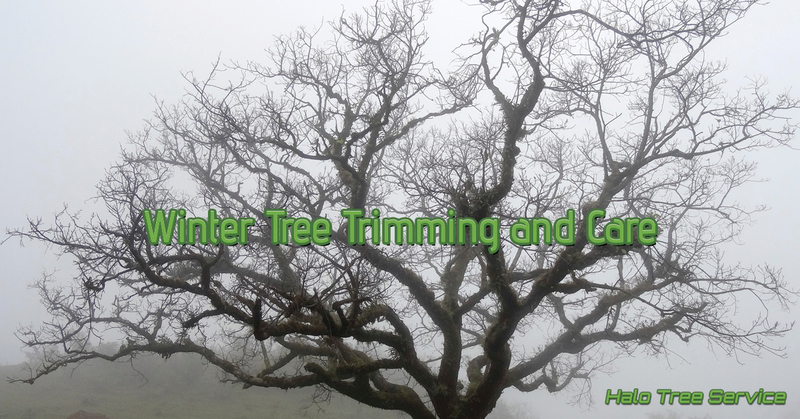 When pruning in the winter your tree will be far less susceptible to the diseases that will be traveling around and are prevalent in the summer months, rather than the winter. It’s a sad thing to consider, but sometimes trees cannot be preserved and the time of year where they can be removed with the most ease is actually the winter. Due to ice damage and storm issues, you may find problems in the tree’s health. Your next step should be to order an inspection of the tree to determine if it needs to go. The process will, of course, include an inspection to see if anything can be done, but you may have to consider giving up a tree to make way for new healthy plants to thrive. Most don’t put much thought into mulching: what it is or the benefits of it. In reality, mulching is thought of as decorative: a nice little mound at the base of the tree and makes it look uniform with the rest of your landscape. It actually serves several purposes that are all more beneficial in the winter than any other time. It can help to insulate your roots to protect them from colder temperatures and retain water which will keep your tree’s roots moist and healthy. Taking care of your trees is a year-round responsibility. But handling more of the inconvenient features during the winter months can ensure that you won’t suffer the hassle when you’re looking to have fun outside in the shade of your favorite trees. If you’re in need of stump removal, or general tree service in Macomb give Halo Tree Service a call! We’d be happy to discuss your tree pruning needs.